Question for Kingpin-I hope this is the right place. Did he ever finish Black Day at the Firehouse? I read what was up on FF.net, and I'd LOVE to know how it ended. And I finally got to read Love Songs-Blessed. Loved it! I was wondering what was up with Eric, and now I know. FINALLY! "The Real Ghostbusters" (the complete series) is HERE! As far as I know, he never did. 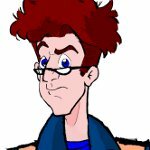 We can be pretty sure Egon survived, though. I'm tentatively scheduling a story for January 1st. I just sent the beta link to the Usual Suspects. It's not a Ghostbusters story. It's set in the Ectozone Ghostbusters universe, though, and stars some familiar original supporting characters. It's part one of a story called "Kyrie Was Here". You'll see what that means as it unfolds. At some point after that I'm working on a short story with actual Ghostbusters characters in it. I've just finished "Kyrie Was Here, Part Two". Ogre hasn't looked it over yet, but when he does I'll upload the beta and send the link to the usual suspects. I'm provisionally hoping to put this one out this Sunday, February 3rd, my GBN "Sweet Sixteen", along with some other updates to the site. I know that's not giving the betas the usual length of time, so we'll see how it goes. EDIT: Sent to the betas just a moment ago. "Kyrie Was Here, Part Three" was just finished. Ogre will get a look, then it will be sent to the betas. I'm not slotting it yet; I want to have something to put out on the Ectozone anniversary on May 13th. If Part Four is well enough underway by around the end of the first week of April or so I think I can get that ready for May, I'll go ahead and release Part Three on April 16th. If not, I have Part Three for May 13th and will put out Part Four (which will be the conclusion) when it's ready. I've really enjoyed writing this story, and I think it shows on how fast it's been released compared to other stuff from recent years. The fact that it's practically a different genre almost certainly contributed to that; it's as close to writing something that's not Ghostbusters as I can get while still staying somewhere in Ectozone fanon. If you haven't given it a look yet, I hope you will--especially if you liked Terchi and Coda in previous stories. Ogre's seen part 3; the beta link should be going out tonight or tomorrow. Probably tomorrow. I think at this point, I'm going to have Part 4 ready for May; Part 3 is now set to be released next Tuesday, April 16, 2019, one week from today.